Gaining in popularity, the Suzuki Sidekick/Geo Tracker is an undeniably stout 4x4 platform. However the stock IFS (control arms, CV drive axles, and cast aluminum 3rd member) leave much to be desired. Using a 1986-1995 Suzuki Samurai front housing (taking into account: width, lug pattern, passenger-side drop, driveshaft flange, and gearing options) stuffed with 4130 26-spline inner shafts and Birfields, a Solid Axle Tracker was born. The new solid axle swap is designed to run a 2.0" - 8" stroke coil-over and features reinforced upper shock mounts, 1.5" x .188" DOM radius arms with a beefy 1/2" plate gusset with vulcanized rubber bushings for a silent on-road ride. Using a combination track bar bracket and power steering reinforcement plate, the new track bar easily mounts to the frame and the axle mounts. Complete system ships with: transmission/arm mount, front radius arms with articulating joints, track bar with adjustable Heim joint, track bar/steering box reinforcement mount, adjustable upper strut brace, new heavy duty drag link, tie rod, and brake lines. Intended as an upgrade to our popular 3" Super Articulation system, this axle swap takes the Sidekick/Tracker to the next level. Welding is required for installation of the radius arm mounts to the axle and upper coil mount. All other suspension components are bolt-on. This system will clear a 33" tall tire without any modifications. It is recommend to install 1" wheel spacers on the front axle with this system installed. 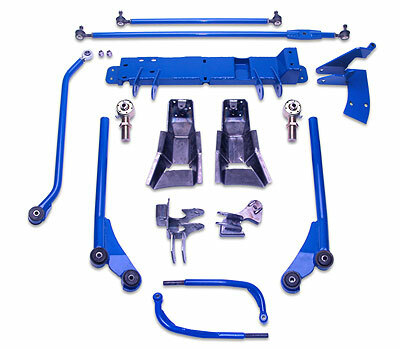 This system ships with all front end SAS components listed above as well as our full rear suspension system including: trailing arms, rear upper V-Bar, differential carrier bracket, rear coils, shocks, brake line, 3/4"-16 heim joint, and necessary urethane bushings and sleeves. 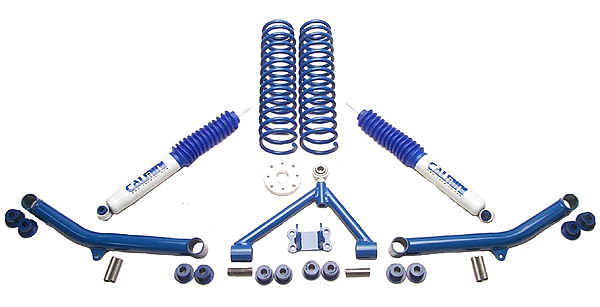 Purchase of this COMBO system will require you to source: Samurai front axle, 8" travel coil-over shocks w/coils, and 1" wheel spacers. Exhaust modifications required on some models depending on configuration. Requires OEM Samurai Front Housing.